- How often do you feel energized, powerful, fulfilled? - How often will be normal...? - Well, let's say 80-90% percent of the time. It is a life, so. - Doesn't make me feel better. *Groan* *Silence* You're kidding, right...? After having this conversation with 85% of women, I work with I decided it is a time to talk about our Energy. If you are exhausted way too often, Tired or Feel like someone drawn you most of the time this article is for You. Why for most of the women the state of tension and lack of energy becomes normal these days? Why do women feel emptiness, exhaustion, heaviness? I have been working with questions like this for several years now, but it still seems like there is always something new to uncover. I'll be honest sometimes I wake up in the middle of the night because of the unbearable pain, heaviness on my shoulders. I stand up, walk around. This pain is purely psychological as it happens only when I have more pressure, some additional publication to finish, massive events to organize or anything in my mind I might feel tense about. I go to the bathroom and look at myself in the mirror. I see generations of women behind my back carrying shoulder yokes, heaviness on their backs. I see them rising up and carrying on. I see them losing lightness and joy under enormous pressure. They found it again in their daughters and granddaughters. My question is: are we as the next generation of women able to receive the gifts the women who stand behind our backs wished for us? Yes, they wanted us to have independence, freedom, abundance. But what their hearts longed for most of all were lightness and joy that comes with it. I am fully aware that I live in an incredible modern part of the world. I can do anything I want as a woman, earn money, have my own business, educate myself on basically... anything. Most of those simple and necessary for a human spirit things my grandmother and even my mother didn't have. I have an incredible network of successful and supportive women around me, opportunities, safe home, family... Why in the world do I feel that I still have a burden, heaviness on my shoulders? Why do I wake up in the middle of the night because of the unbearable weight I seem to carry? It all comes to our energy, emotional, physical, mental. Even if we try to take care of our body, how often do we consciously pay attention to invisible, but not less important aspects of our wellbeing? Energy is everything for a woman. We're emotional beings, we're deeply connected with nature, the Universe, the unseen aura around us, the vibration of our thoughts, environment, even the feelings of other people. Hundreds of facts affect us every day, provoke our reactions and ask for our attention. it is needed to stop and reconnect with our spirit, with our heart. As the spiritual aspects such as deep connection with our nature, self-love not just protect, but give us energy. I see it as one of the biggest reasons why so many women feel lost, empty, disconnected nowadays. We don't acknowledge the needs and gifts of a woman's nature. We don't balance our energy, we absorb negativity and hold it inside as we don't know how to deal with it. Even if it feels like you can't have it all like you have to choose between demands of the exciting career or a happy, joyful life, between your success and fulfilling relationships, you can have it all. You're born to have success and love, great achievements and happiness AT THE SAME TIME. Why am I so sure? Simply because I studied and observed female brain enough to know: our energy, nervous, hormone systems are made in a special way so we can manage all we want with joy and grace. We just forgot how to do it. To see if you need to reconnect with your female power, let's do a little test. Imagine you stand on the small piece of land, an island. On the right side, you see a huge, beautiful ocean, shiny and calm on a sunny day. On the left, you see an incredible 100 years old tree, its strong branches go in different directions, thousands of leaves whisper and are slowly moved by light wind. Now take a deep breath and answer the question: with which picture do you feel more connection? It seems like a simple test, but it gives a huge understanding of many things that happen to us. Hard to believe at first, but see for yourself. The pictures you chose reflects what kind of energy, female or male, is dominant in you. if you chose ocean it means that female energy is stronger in you. If you chose the tree you operate on male energies more. Everyone has both female and male energies no matter the gender. Usually, man has more male, while woman female, but isn't always like this. We live in a world where male energies dominate. That's why often women who feel a call for great achievements in the world, try to follow the male way of thinking and operating. We put our feelings and emotions on hold, we stop going deep inside and start to follow the rules of willpower, aggression and a strong determination. After a while, we found ourselves depressed and exhausted, destroyed, lost or alone. Because when a woman operates on male energies without ANY respect to her personality, nature, desires she loses the sense of her own self. 3) But if you decide to trust them this time, they definitely fail something! 9) You feel like the man strong enough for you doesn't EXIST. Just a vanished kind, like dinosaurs. Do you find any of those? I see so many women with amazing talent and great potential, successful and gorgeous, who suffer because they lose connection with the source of energy inside. It's my mission and my dream to see women empowered, happy, joyful. 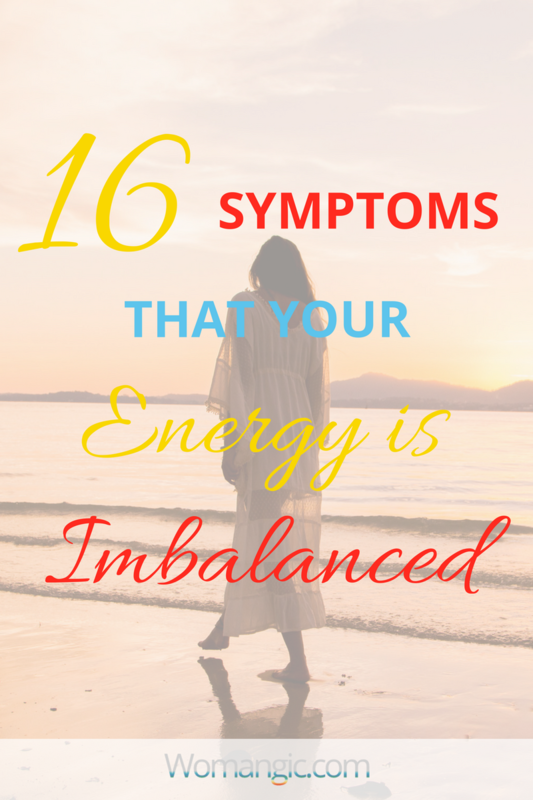 If you find symptoms in both cases, it simply means that naturally, you have more female energy, but it is imbalanced as you use masculine aspects more. P.S. I remember times when I felt exhausted and empty inside caring about everyone around, but myself. I didn't feel good enough, I felt like nothing I did matter. Many of these, as well as the level of appreciation, respect, and support comes to Self-Worth. Knowing my worth helped me to transform my life, from being a shy girl to a woman who runs a successful business, doing what I always dreamed to, and helping thousands of people on the way. My dad never was helpful or showed his appreciation, while my mom just tolerated it all, it was painful for me, and I struggled to trust or respect men. When I heard about women who are highly respected, appreciated and deeply loved in their relationships, I didn’t believe it was possible. Until I raised my value. I met so many men who are highly respectful of women’s nature but struggle because women don’t appreciate themselves. It's unbelievable what a woman who knows her worth can do. Anything. When You know your Worth, You connect with your power. You ask for what you want and get it. Because you deserve it. The Universe mirror your level of self-worth with opportunities, people you meet and the way others treat you. Often Life pushes us to step into our power through negative experiences or aggressive people. Have you been there? I did. Until I realized: Why wait for that?! There are tools, tips, and tricksyou can use today to understand your worth, connect with yourself, balance your life. We have it in S.P.I.R.I.T. 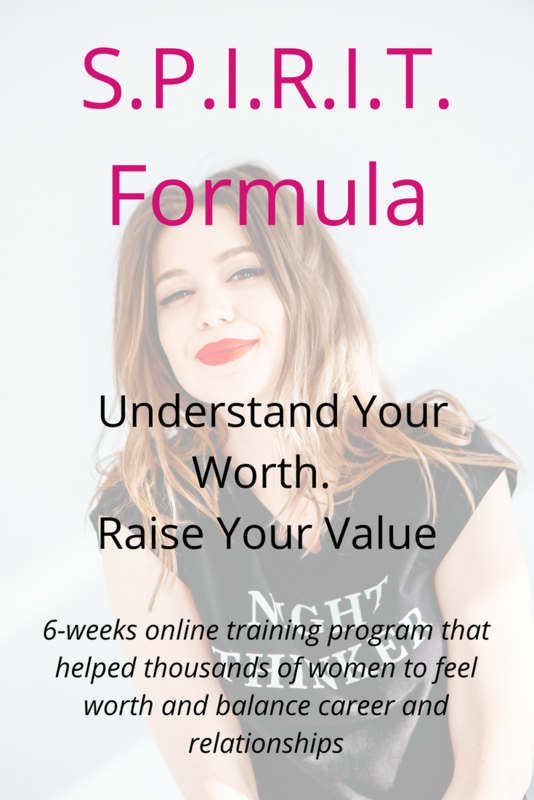 formula program: A 6-week signature online course that already helpedthousands of women to understand their worth and balance their career and relationships. These principles are what I used and still do to transform my life, everything in the program is personal to me. It's synthase of experience, years of learning and practicing coaching, psychology, and meditation. This program is a light of my heart I hope to share it with you and as many women as possible because even if you don’t know it yet, I do know: You deserve it. Learn more about S.P.I.R.I.T. formula here.